Is this yet another GLADIO-style attack in Europe? 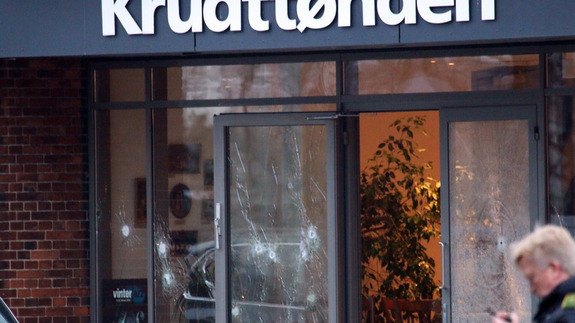 One man was reportedly killed and others injured as two masked gunmen opened fire at the Krudttoenden Cultural Centre Cafe in Copenhagen (image above), after the venue was sprayed with over 200 bullets. We’re then told that the gunman then fled in a carjacked Volkswagen Polo. 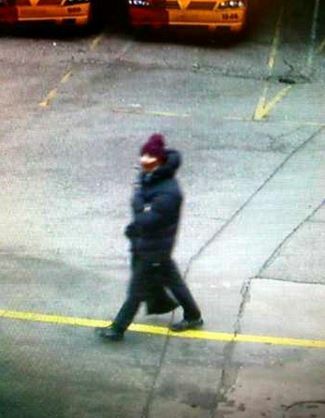 As with the Paris action-drama, the two gunman are now ‘on the run’. For good measure it seems, and identical to the Paris template, their was a second shooting – outside of a Synagogue, where two police officers were wounded in the arms and legs, and a civilian man was also killed. A gunman fled on foot. Unlike the Paris Attacks, there were no “amateur cell phone videos” made to record the attack, only official CCTV images released to the public, perhaps because of issues regarding controlling the set and additional problems with poor execution in Paris which prompted wide-spread criticism over the “fakeness” of the films. As a result, the Danish government have deployed the military and declared Martial Law until the terror threat level is reduced. Organizers were hosting a dubious debate entitled, ‘Art, Blasphemy and Freedom of Expression’, with the star speaker being none other than Lars Vilks, 68, a Swedish cartoonist who sparks riots across Europe and the Middle East after publishing offensive drawings that depicted the Prophet Mohammed as a dog in 2007. TROUBLED: Cartoonist Vilks has been targeted ever since his controversy in 2007. If this was indeed another contrived false flag event, the staging could not have been better as this event also marked the anniversary of the Islamic fatwa against British author Salman Rushdie for his book The Satanic Verses. The global media appeared to have the narrative in place in real-time. “I clearly consider this an attack on Lars Vilks,” said Helle Merete Brix, one of the event’s organizers – a declaration which she made to AP only minutes after the incident took place. Last year a mentally ill Pennsylvania actor, Collen Rose, rebranded by the media as ‘Jihad Jane’ was sentenced to a 10-year prison term for “plotting” to kill Vilks, and two brothers were imprisoned for attempted arson in 2010 when they tried to burn his home down in southern Sweden. Not surprisingly, the laconic Vilks has been complaining as of late that because of all the violence fewer organizations were inviting him to give lectures. From a GLADIO perspective of using terror to coerce a government into a specific geopolitical position (as appears to be the case with France last month), Denmark does not appear to be falling outside of the US-led “Coalition” against ISIS in the Middle East. Last September, Denmark joined France, Britain, Australia, the Netherlands, Belgium, and Canada in launching airstrikes in Iraq. However, Denmark is NOT involved in the campaign in Syria, but that could change now that ‘terror’ has finally arrived on its doorstep. Could this be a Hebdo Copy Cat attack? Perhaps, but readers may want to keep an eye out for any sudden geopolitical moves, or right-wing political advances in the immediate aftermath of this shady event. This entry was posted on February 16, 2015 by Amir Alwani. It was filed under Denmark, false-flag, news, tyranny and was tagged with Charlie Hebdo, Copenhagen Attacks.